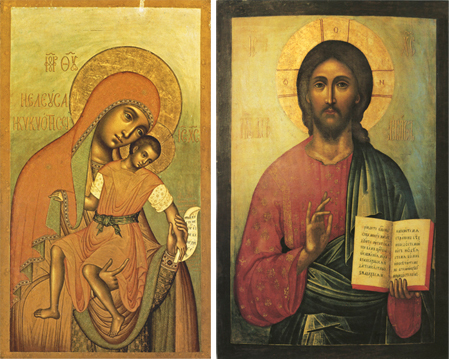 Here is a 1668 icon of the Virgin by Simon Ushakov, the founder of the famous Armory school of iconography and now hangs in the Tetrakov Gallery in Moscow. It is a part of our last and sixth set of Matched icons. The sweetness of expression of Mother and Child in their faces and their movements reminds us that God is personal and real. Her expression is almost luminous, for she holds her great joy, and offers to share this intimate love of God with each of us. This 1670 icon from the Armory school of iconography of Moscow is a fitting complement to the icon of the Virgin to its left. All-Merciful Saviour is a name given to a feast of the Lord, and here before us it is manifest in visible form, for the Lord’s eyes hold love and mercy for all things, visible and invisible, which he made. His eyes seem to look not only at you, but through you; begging you to look back through His eyes into Heaven.